Ariels are puppets that appear in the Artaud Theater in Silent Hill: Origins. They hang upside down from the ceiling and attack by grabbing and choking Travis Grady. Instead of feet they have another pair of hands, holding onto the strings they hang from. Attacking one will result in knocking it down, where it will then stand on its hands and begin to ‘kick’ instead. As they are made from fragile porcelain they are quite weak, but they can be tricky when dealt with in numbers or in confined spaces. The name “Ariel” is derived from the servant character of the same name from William Shakespeare’s The Tempest which Alessa Gillespie saw at the Artaud Theater. As their feet are hands, holding onto the strings, they could symbolize that they are in control, and that they can let go of the strings that bind them; unlike Travis, where the memories of his father still linger. It is likely that the theme of ‘hanging puppets’ bares resemblance to Richard Grady’s death. Ariels often work in pairs or threes. They can be easily avoided by turning off the flashlight, but beware of making loud noises in their presence. However, they can still be difficult to avoid in narrow corridors. After being struck down from the ceiling, they are stunned for a few moments, and completely defenseless. These moments are the best opportunity to kill them with a finishing move, crushing them easily. 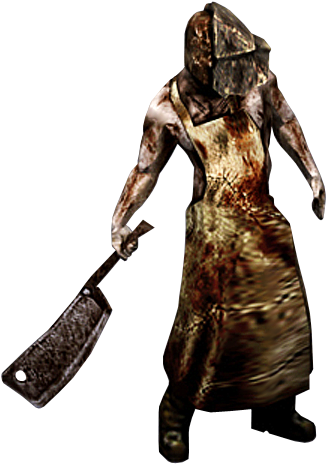 The Butcher is a humanoid creature much like Pyramid Head in design, behavior, and function. He is well-built with a butcher’s apron which is almost completely covered in blood. He also wears a series of metal plates that cover the left half of his face and left shoulder. The other half of his face is fairly empty, save a deep hole where the ear would be on a human head, and resembles that of Valtiel. His trademark weapon is a heavily over-sized meat cleaver called the Great Cleaver. The Butcher represents cruelty and sacrifice, particularly that of the Order. His calm, emotionless torturing and slaughtering of other monsters speaks of the Order’s tendency to murder and sacrifice human life for their worship. The Butcher also represents Travis’s inner rage and pent-up anger, and so is involved heavily in the Bad Ending. There are some that speculate that the Butcher may actually be Travis himself, as implied by the various voices heard during the Bad Ending, as well as by the description of the Butcher accolade. The helmet that covers half of his head could possibly symbolize a split personality. Travis is shown to be an animal lover, and would probably find a butcher repulsive; therefore it follows that his split personality would be his complete opposite, i.e. a “butcher” who kills animals. There is another possibility that states that the Butcher represents everything Travis fears about himself and/or everything he could become. The Butcher’s method of killing involves slicing through the reproductive organs of his victims, representing his anger associated with repressed sexuality, as truckers often find it difficult to sustain a steady or healthy love life. 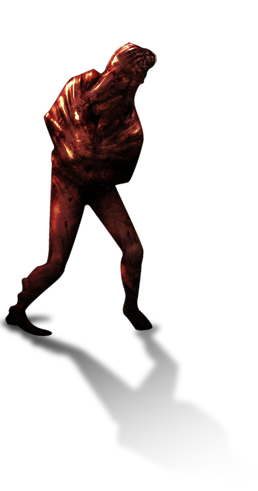 The Straightjacket is a shambling creature wrapped in flesh that appears inSilent Hill: Origins. It twitches violently and appears as if it is trying to break free of the flesh.The Straightjacket serves as a semi-boss near the ending portion of Alchemilla Hospital (after which Travis obtains the first piece of the Flauros) and, like thenurses, is capable of using a grappling move. They can be found in every area of the game. 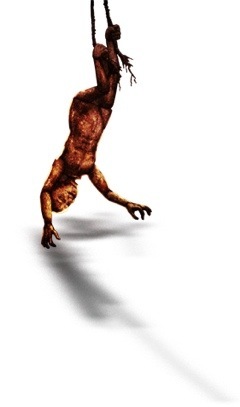 While they initially appear nearly identical to the Lying Figures seen in Silent Hill 2, they lack the feminine features of those creatures and seem to be trapped in a straightjacket of skin (indicated by the notable folds and creases around their torsos) as opposed to the Lying Figure, which is simply trapped in stretched skin. They are also similar to the Armless Man from the film, though there are subtle differences between them as well. At the Artaud Theater, they are more bloodied than usual. These creatures behave quite differently than the Lying Figures, such as spewing balls of acid while grappling rather than spraying it, as well as their ability to run at a surprising speed. They chase Travis Grady until he enters another room/building or kills them. Outside, if the player does not react quickly, Travis can easily be swarmed by an infinite number of spawning Straightjackets roaming the streets. They will also jump up and wrap their legs around Travis, and if the player fails to successfully throw off the creature, will spew acid into Travis’s face doing moderate damage. They are the most common and plentiful enemy in the game and are useful if one wishes to gain the “Butcher” ending.